The SuperLok standing seam roof system blends the aesthetics of an architectural panel with the strength of a structural panel. This panel has earned uplift ratings that are the highest in the industry for standing seam roofs, assuring the reliability of performance. This panel is Factory Mutual approved to satisfy stringent code requirements and is ICBO approved. Fasteners: Concealed fastening system. A choice of concealed fastening clips are available for this panel system including UL rated clips. These clips hold the panels firmly in place without unsightly exposed fasteners. Each clip system offers the ability to accommodate thermal movement. 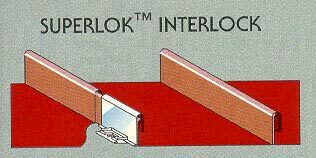 Usage: SuperLok is a field seamed panel that combines a slim rib with exceptional uplift resistance. This panel has been designed to withstand the most rigorous conditions. This system was designed to be installed over open framing, 5/8″ plywood, or a composite roof assembly may be used as alternate substructures. Factory notched for end laps Ease of erection, can be installed both directions or simultaneously. Clip allows 2″ panel movement. Allows for expansion and contraction. Sealant factory applied. Less field labor and longer life. Weather tightness warranty available. Customer confidence. System qualifies for UL 90 wind uplift ratings under four types of construction including open framing, composite, and solid deck methods. Lower insurance costs possible. Machine Seamed Meets stringent code requirements, such as, Factory Mutual.